Today is World AIDS Day. Please take 60 seconds out of your day to reflect and remember the millions and millions of people affected and infected by this horrible HIV virus. Around 10,000 of those who lost their lives in this battle were hemophiliacs and are my blood brothers. I have been living with HIV for 27+ years. 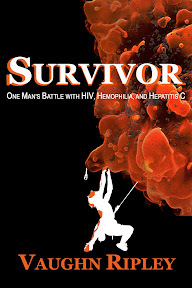 If you want to read my story and the journey that I have struggled through, pick up my book Survivor. As long as I breathe I will continue to believe in my dream of a world without AIDS. Join my dream and together we can defeat AIDS!